Bumped up with newly-found photos of a model showing the ship in glorious detail. Found this while looking for something else. HMS Ville de Paris of 110 guns in Torbay, 1805 by Derek Gardner. Notice the flag on her main mast - this indicates that the ship is serving as the flagship of a full Admiral. In this case, in 1805, she was the flagship of Admiral The Honourable Sir William Cornwallis, Commander-in-Chief of the Channel Fleet. A little bit more on HMS Ville de Paris' role as a Lazarette or Lazaretto. Lazarettes or Lazaretto Hulks were principally used for the airing of cargoes of cotton coming from the Levant or the eastern Mediterranean. In the 18th and 19th centuries, the Government was concerned with preventing the entry of plague and other diseases into the UK. Ships leaving the Mediterranean were inspected before departure and were given a clean or foul bill of health. If they had a foul bill, they were required to perform quarantine on arrival in the UK. The main quarantine station was at Stangate Creek in the River Medway. Others were established on the Motherbank off Ryde on the Isle of Wight with smaller ones off or near the major British ports. In 1805, it was decided to set up a new quarantine station at Angle Bay off Milford Haven. It as formally established by an Order in Council dated 5th April 1805 and was intended to serve ships going into ports in Cornwall, Devon, the Welsh ports and as far north as Liverpool and the Isle of Man. This was intended to reflect the fact that those ports, particularly Liverpool, had grown in importance to the point where potentially infected cargoes were as likely to to go into Liverpool as they were into London. Until 1813, ships with foul bills (where the crew themselves were sick) were still required to go to Stangate Creek, but in July, the Milford Haven Station was established as an alternative foul bill station to Stangate Creek. Ships which actually had plague aboard were still required to quarantine at Stangate Creek. The Milford Haven quarantine station reached its peak in 1825 when it had no fewer than nine lazaretto hulks, including HMS Ville de Paris. By January 1845, HMS Ville de Paris was one of only three hulks remaining off Angle Bay and shortly after that, the ship was taken into Pembroke and was broken up. The last of the Angle Bay lazaretto hulks, the former HMS Triumph, was broken up in 1850 and the station finally closed in 1865. HMS Ville de Paris was a 110 gun, first rate ship of the line, built at the Royal Dockyard, Chatham. Built to a design by Sir John Henslow, Surveyor of the Navy, the ship was originally intended to be the third member of a class of four 100 gun first rate ships. The other members of the class, known as the Royal George Class were HMS Royal George, HMS Queen Charlotte, both of which were also built at Chatham and HMS Hibernia, built by the Royal Dockyard at Plymouth. Before construction started however, it was decided that there was enough room on her gundecks for the gunports to be placed closer together, allowing her to carry an extra ten guns. The design of HMS Hibernia was lengthened, allowing that ship to carry 120 guns. As a result of this, HMS Hibernia and HMS Ville de Paris are not regarded as being ships of the Royal George Class, despite being built to the same basic design. The reason for this was that the Admiralty had decided to follow the French practice of building bigger and more heavily armed ships. Up to HMS Queen Charlotte, British first rate ships had carried 100 guns, whereas at the time, their French equivalents carried 120 guns. The first rate ship of the line was the equivalent in the navies of the 18th and early 19th centuries of todays nuclear powered aircraft carriers. They were so expensive to build, operate and maintain that their ownership was restricted to the navies of the superpowers of the day, those of Spain, Britain and France. In the Royal Navy, these ships were so expensive to operate and it was so difficult to find enough men to crew them that in peacetime, they were usually kept in the Ordinary and whenever a war ended, they were amongst the first ships to be decommissioned. In wartime and particularly in the set-piece naval battles of the time, these gigantic ships were worth their weight in gold. It might seem odd that the Royal Navy would give such a powerful and prestigious warship like HMS Ville de Paris a French name and not only that, name her after the enemy's capital city. 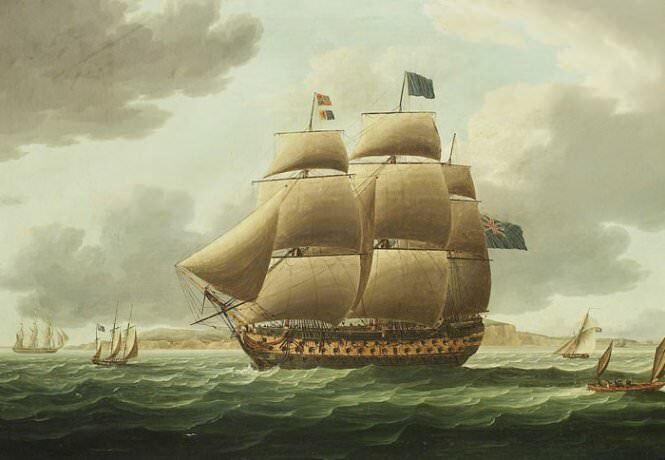 In actual fact, HMS Ville de Paris was named after the flagship of the Compte de Grasse, which after he had been largely responsible for the military disaster at the Seige of Yorktown during the American War of Independence, was captured by Vice-Admiral George Rodney at the Battle of the Saintes in April 1782. After her capture, the original Ville de Paris had foundered in a storm on her way back to the UK. HMS Ville de Paris was ordered from the Royal Dockyard at Chatham on 17th January 1788. At the time, the Chatham Royal Dockyard was in the throes of having all it's building facilities restored and updated after a century of neglect. Because of the end of the Dutch Wars with the accession to the Throne of Queen Mary II and her Dutch husband, Prince William of Orange in 1688 and the beginning of more than a century of on-off war with France, Chatham Dockyard had ceased to be the Royal Navy's principal fleet base. The fleet was now primarily based at Portsmouth and Plymouth. The Admiralty had decided that Chatham would become a building yard, so a great deal of time, effort and money had been spent at Chatham since about 1770 in building new slipways, drydocks and upgrading all the building facilities. The Royal Dockyard at Chatham was capable of building up to two first rate ships simultaneously and in the period between 1782 and 1788, this is exactly what they were doing, with HMS Royal George and HMS Queen Charlotte both being built at the same time. Once HMS Royal George had been launched from the No.1 slipway in September 1788, construction of HMS Ville de Paris could begin. The project started with the expansion of the 1/48 scale sheer draught into full size drawings in chalk on the Mould Loft floor. These were used to build the moulds which were then used as patterns used by the sawyers to cut the full-sized timbers to be used in the new ship's construction. The first keel section was laid on the No.1 slipway at Chatham on Wednesday 1st July 1789. Ships of this size took a long time to build because of the enormous amounts of timber which needed to be seasoned and cut or steamed into shape, before being assembled on the slipway. The project was initially overseen by the Master Shipwright at Chatham, Mr Nicholas Phillips. He retired in 1790 and was replaced by Mr John Nelson, who died in office in 1793. John Nelson was replaced by Mr Edward Sison, who oversaw the final stages of construction and the launch of HMS Ville de Paris. A few months after the keel was laid, the French Revolution occurred across the English Channel and set off a chain of events which led to the outbreak of war with France three and a half years later, in February 1793. The huge ship was eventually launched from the No.1 slipway into the River Medway on 7th July 1795, almost six years to the day from the laying of her first keel section. After her launch, the ship was fitted with guns, masts and rigging at Chatham. When she was complete, HMS Ville de Paris was the most powerful warship ever to have been built in a British shipyard. Everything about her was massive. She was the same size as her two half-sisters, HMS Royal George and HMS Queen Charlotte. She was 190ft long on her upper gundeck and 156ft 1in long at the keel. She was 53ft 2in wide across her beams and drew 14ft 8in of water at the bow and 18ft 4in at the rudder. Her hold, the space between her orlop deck level and her bottom, was 22ft 2in deep. She was a ship of 2,351 tons and as such, was the heaviest warship ever built in a British shipyard up to that point. She was also the most expensive; her construction had cost the then phenomenal sum of £78,830. HMS Ville de Paris was armed with 30 32pdr long guns on her lower gundeck, 30 24pdr long guns on her middle gundeck and 32 18pdr long guns on her upper gundeck. She also carried 14 12pdr long guns on the quarterdeck, with 4 12pdr long guns and 2 32pdr carronades on the forecastle with 6 24pdr carronades on the poop deck. In addition to these guns, she would have carried between 12 and 20 half-pounder swivel guns attached to the handrails around her upper decks and in her fighting tops. After commissioning at Chatham under Captain Walter Locke on 17th September 1796, HMS Ville de Paris was sent to join the Channel Fleet, then commanded by Vice-Admiral Sir Alexander Hood, the First Viscount Bridport. Captain Locke was a junior commander whose previous command appointment had been as Master and Commander in the Hospital Ship HMS Charon and his role was to merely act as a caretaker commander until the ship was fully ready for action. At about this time, the French were in the advanced stages of planning an invasion of Ireland. With the Spanish having changed sides and the border with Spain accordingly stabilised, the British were the only really dangerous opponent they faced. In Ireland, opposition to British rule, which had been going on for centuries had been galvanised by the French Revolution in 1789. The British had not helped their cause by imposing the Penal Laws which discriminated against the Catholic majority in Ireland. This in turn led to the rise of the non-sectarian Society of United Irishmen, which was dedicated to replacing British rule in Ireland with a republic. Originally a non-violent purely political movement, the Society was forced underground in 1793 when it was banned by the British. Two of the Society's leaders had gone to France to try to elicit French support. The British could ill-afford to mount a military campaign in Ireland to try to repel any French invasion, so some of the Penal Laws were repealed later in 1793. The French for their part had long cherished the idea of expelling the British from Ireland, calculating that it would be a major blow to British prestige and could be used as the springboard for an invasion of Britain. These ambitions had until now, been hampered by a number of things, other campaigns being fought, the terrible state of the French Navy following the Revolution, the tactical defeat at the Battle of the Glorious First of June being the main obstacles. By 1796 however, the situation had stablised somewhat. The aforementioned peace with Spain, the end of the civil war in the Vendee Region of France and the stabilisation of the political situation with the French Navy had convinced the Revolutionary Goverment that the time was right to attempt an invasion of Ireland and preparations got underway with a view to launching the campaign over the winter of 1796 into 1797. The Society of United Irishmen promised the French Government that they could raise an army some 250,000 strong to support any French force which managed to land in Southern Ireland. On 15th December 1796, the invasion fleet left Brest, bound for Ireland and were duly spotted by the blockading British frigates, which included the 44 gun razee frigate HMS Indefatigable, commanded by Captain Sir Edward Pellew. Disaster had struck the French force as soon as they had left Brest. Bad weather, navigational errors and confused signalling had left the fleet scattered across the approaches to Brest by the following day. The French commander-in-chief, General Hoche had embarked in the frigate Fraternite, which had managed to become isolated from the rest of the force. The French 74 gun ship Seduisant had run onto rocks and had been wrecked with the loss of over 600 men. On 19th December, the French had finally got their act together and had begun to head for Bantry Bay in the far south-west of Ireland. The Fraternite was still up to this point missing. What the rest of the French fleet didn't know was that the Fraternite had headed west across the Western Approaches and was cris-crossing them looking for the rest of the fleet. What the French also didn't know was that they were heading out to sea into the teeth of the most violent storm in living memory. The French, leaderless, had arrived in Bantry Bay on 21st December. The French called a council of war amongst the remaining commanders and decided to land on the 24th, just as the storm was really beginning to bite. During the night of Christmas Eve of 1796, the storm broke. The French ships were literally blown off their anchors, out into the Atlantic Ocean. Many of the French ships were destroyed in the storm, lost with all aboard. One of the French 74 gun ships, the Droits de L'Homme became involved in a running battle in appalling weather against Pellew's HMS Indefatigable and was driven ashore on the coast of Brittany and wrecked while it was only Pellew's extraordinary seamanship which saved his ship from suffering the same fate. With the invasion fleet scattered in the Western Approaches, the individual French ships began to head back to France. On 20th December, Sir Edward Pellew in HMS Indefatigable had anchored in Carrick Roads, off Falmouth and word reached the Admiralty of what had been going on. They immediately ordered Lord Bridport to put to sea and on Christmas Day, he ordered the Channel Fleet to assemble at the anchorage off St. Helens, Isle of Wight. The ships moored in the Spithead Anchorage, off Portsmouth had a real struggle getting out, because of the strength and direction of the wind. HMS Prince (98) missed her stays (which means she attempted to go about, that is to change tack by passing the bow through the eye of the wind, but was unable to complete the manoeuvre) and collided with HMS Sans Pareil (80), damaging both ships, HMS Prince to the extent that she needed to go into the Dockyard at Portsmouth for repairs. Also, HMS Formidable (90) collided with HMS Ville de Paris, damaging both ships and HMS Atlas (98) ran aground. In June 1797, HMS Ville de Paris was sent to Lisbon to replace HMS Victory as flagship to Vice-Admiral Sir John Jervis, the Earl St. Vincent, Commander-in-Chief Mediterranean Fleet. HMS Victory was in poor condition and was ordered to return to the UK so that her future could be decided. Jervis had chosen HMS Ville de Paris to be his flagship. In February 1797, Jervis had commanded his British fleet in their defeat of a larger Spanish force at the Battle of Cape St Vincent and had been showered with rewards as a result. After the battle, Jervis had gone into Lisbon, in British ally Portugal. There, he received reinforcements including HMS Ville de Paris. After shifting his command flag to HMS Ville de Paris, he ordered his fleet to leave Lisbon and cruise off Cadiz, where the Spanish survivors from the Battle of St Vincent were holed up. Jervis' force comprised 21 ships of the line and he was hoping to provoke the Spaniards into coming out for a second round. At this time, the fleet at Spithead, back in the UK was embroiled in the Great Mutiny and to occupy the men's minds, Jervis ordered that his fleet approach Cadiz and bombard the city. After the Great Mutiny had been settled peacefully, Jervis and his fleet continued with their task of keeping the Spanish safely bottled up in Cadiz. On 14th February 1799, Captain Calder was promoted to Rear Admiral and his place in command of HMS Ville de Paris was taken by one of Lord St. Vincent's proteges, Captain George Grey, who had been without an appointment since he had paid off HMS Victory at Portsmouth. Grey had been Jervis's flag-captain at the Battle of Cape St. Vincent and before that, when Jervis had flown his command flag in the 98 gun 2nd rate ship of the line HMS Boyne. Sir Robert Calder was later, in 1805, to command a detachment of the Channel Fleet which intercepted and defeated the Combined Franco-Spanish fleet under the French Vice-Admiral Villeneuve which had led Nelson on a merry chase from the Mediterranean, across the Atlantic, around the Caribbean and back, forcing them to flee into Cadiz. When they tried to escape from there, Villeneuve's force was cornered and defeated again by Nelson at the Battle of Trafalgar. HMS Ville de Paris remained as Lord St. Vincent's flagship until she was ordered to return to the UK for a refit at Plymouth in October 1799. By the middle of December, the work was complete and HMS Ville de Paris left Plymouth bound for Spithead. On 26th April 1800, Lord St. Vincent was appointed to command the Channel Fleet and once again, he chose HMS Ville de Paris to be his flagship. The ship came under the command of Captain Sir Thomas Troubridge, Baronet. Lord St. Vincent remained in HMS Ville de Paris as Commander-in-Chief Channel Fleet until he was replaced by Admiral the Honourable William Cornwallis on 9th July 1803. Jervis had taken up the position of First Lord of the Admiralty. On 17th August, in a case of taking a sledgehammer to crack a nut, HMS Ville de Paris captured the French privateer cutter Le Messager, of 6 guns. By July 1805, Lord Nelson was in pursuit of the Franco-Spanish Combined Fleet under Vice-Admiral Villeneuve. At the same time, the French Atlantic Fleet under Vice-Admiral Ganteaume was preparing for sea as part of Napoleon's so called Grand Plan to invade Britain. On 20th July, Ganteaume received orders to put to sea and rendezvous, firstly with the Rochefort Squadron, with five ships of the line off the Lizard, and then with Villeneuve's force. This combined force was intended to then overwhelm the Royal Navy's Channel Fleet with weight of numbers, allowing Napoleon to cross the English Channel. On 29th July, news reached Cornwallis aboard HMS Ville de Paris of the ship's former commander, now Rear-Admiral Sir Richard Calder's victory over Villeneuve at the Battle of Cape Finisterre. On 14th August, Calder's force joined with the Channel Fleet, by now assembled and cruising around the island of Ushant. On the following day, Nelson's fleet, which had pursued Villeneuve across the Atlantic, around the Caribbean and back, also joined with the Channel Fleet. On 17th August, news reached Cornwallis that Villeneuve's fleet had gone into Ferrol, so he dispatched Rear-Admiral Calder with 18 ships of the line to make sure he stayed there. In the meantime, Nelson had gone into Portsmouth aboard his flagship, the 104 gun first rate ship of the line HMS Victory and had taken HMS Superb (74) with him as that ship was in urgent neet of repairs. At 4.30am on 22nd August, the British fleet headed towards Camaret Bay, where the French were anchored. with HMS Ville de Paris in the lead, flanked on one side by the 80 gun third rate ship of the line HMS Caesar and on the other by the 74 gun third rate ship of the line HMS Montagu. On reaching the Inshore Squadron's position, HMS Indefatigable took the lead. The British fleet had now formed a tight line of battle, astern of the flagship and HMS Indefatigable. At 8am, some of the French ships were seen to be weighing anchor and getting underway. HMS Indefatigable headed towards the nearest French ship, the Alexandre, of 80 guns, which was leading the French fleet, then forming a line of battle. The Alexandre fired a full broadside at the large British frigate, which had no effect. With the Alexandre being out of the range of her carronades, HMS Indefatigable returned fire with her gundeck 24 pounders, then changed course and in company with HMS Ville de Paris and the rest of the British fleet following, headed directly towards the main body of the French fleet. The French fleet began to head towards the mouth of the harbour at Brest. At 10.45, HMS Montagu and HMS Caesar hauled out of the line of battle and made towards the Alexandre; their intention being to attack the French ship. The Alexandre was in company with the 80 gun ship Foudroyant and the 74 gun ship Impetueux. Now that the french fleet had turned around and was headed back into Brest, these three ships formed the enemy's rearguard. At 11am, the shore batteries opened fire, which drew return fire from HMS Ville de Paris, HMS Caesar and HMS Montagu. From 11.30 until just after noon, the French batteries kept up a steady fire on the three leading British ships. A shell struck the spare anchor aboard HMS Ville de Paris and shattered, with fragments flying in all directions. One piece struck Cornwallis himself in the chest, but it's momentum being spent, did him no harm. Another piece struck and wounded one of the ships midshipmen. Although the enemy fire caused no further casualties, the ships hull was struck in several places and her rigging and sails suffered damage. Realising that the French were in a perfect defensive position, backed up with powerful shore batteries, Cornwallis decided that his attempt to bring them to action in Camaret Bay was futile, so he ordered a withdrawal and the British retired back to Ushant. The French suffered casualties of about 20 killed or wounded and the British casualties came to one midshipman wounded aboard HMS Ville de Paris and three men killed and six wounded in HMS Caesar. After this skirmish, the French Brest Fleet made no serious attempt to put to sea, until the 13th December, when a force of 11 ships of the line broke out. The skirmish in Camaret bay was to be the only time that HMS Ville de Paris fired her guns in anger at the enemy. By 1810, HMS Ville de Paris was once again the flagship of the British Mediterranean Fleet. By now, this was under the command of Vice-Admiral the Lord Collingwood, who was seriously ill with cancer of the stomach. Since 1809, Collingwood had been asking the Admiralty to relieve him of duty so that he could return home and die with his family around him. His requests had been turned down by the Admiralty on the grounds that the country needed a man of his skill and experience to command operations in the Mediterranean. By March 1810, he was too ill to continue in command of the fleet. By 5th March, Collingwood had finally received permission to return home and left Minorca aboard HMS Ville de Paris. Vice-Admiral Cuthbert, the First Baron Collingwood died aboard HMS Ville de Paris at 8pm on the 7th March 1810. When his body arrived in the UK, he was laid to rest in the crypt of St Pauls Cathedral in London, beside his friend, Horatio Nelson. 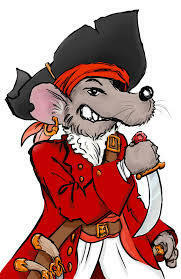 It was said of Collingwood that "A better seaman, a better friend to seamen - a more zealous defender of the countrys rights and honour never trod a quarterdeck". The Napoleonic War was ended by the Treaty of Fontainebleu, signed on 11th April 1814. It was usual practice of the Royal Navy to lay up first rate ships of the line whenever a war ended because the huge costs of running them couldn't be justified in peacetime. On 26th July 1814, HMS Ville de Paris was placed in the Ordinary at Plymouth. With her yards, sails, guns and rigging all removed, gunports and hatches sealed shut and under the care of a skeleton crew, HMS Ville de Paris lay in Plymouth until August 1825, when she was converted into a lazaretto hulk, or quarantine ship and was moved to Milford Haven. There she remained until June 1845, when she was broken up at Pembroke.